Implementation of a wire frame simulator. Compared to the vpSimulator class, it does not require third party libraries to be used. The world frame : This is a fixed frame used to compute the position of the other frames against each other. By default this frame is positionned at the same location as the initial object frame position. The object frame : It is the frame linked to the object. The camera frame : It is the frame linked to the main camera. The external camera frame : It is the frame which corresponds to one external point of view. 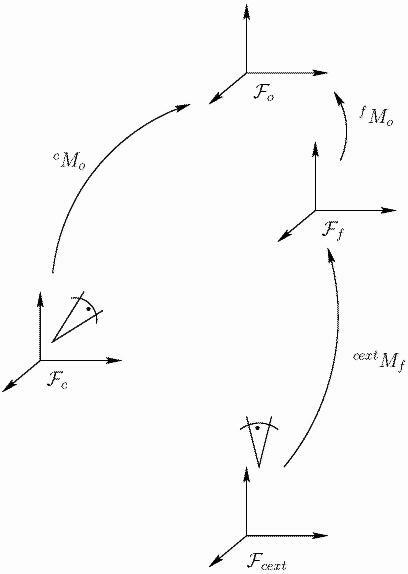 fMo which is the displacement between the world frame and the object frame. cMo which is the displacement between the main camera frame and the object frame. cextMf which is the displacement between one external camera frame and the world frame. The following picture summarize all the previous information. The simulator uses .bnd or .wrl files as 3D scene descriptors. Several scenes can be found in the data folder which is in the directory where you build ViSP. You can move the main external view while clicking in the image. The left click enables to turn, the middle button enables to zoom and the left to translate along x and y. The simulator is able to take into account to camera parameters. You can set the internal and external cameras parameters thanks to a vpCameraParameters. The following example shows how it is easy to use. servoSimu4Points.cpp, servoSimuCylinder.cpp, servoSimuSphere.cpp, tutorial-ibvs-4pts-wireframe-camera.cpp, and wireframeSimulator.cpp. Definition at line 155 of file vpWireFrameSimulator.h. Definition at line 219 of file vpWireFrameSimulator.h. Type of scene used to display the object at the desired pose (in the internal view). D_STANDARD will use the vpSceneObject used to be the object at the current position. D_OUTIL will display a tool which is attached to the camera. The object displayed at the desired position is the same than the scene object defined in vpSceneObject. The object displayed at the desired position is a circle. A cylindrical tool is attached to the camera. Definition at line 212 of file vpWireFrameSimulator.h. Type of scene used to display the object at the current position. A 40cm by 40cm plate with 3 points at coordinates (0,0,0), (0.1,0,0), (0,0.1,0). Each point is represented by a circle with 2cm radius. A 40cm by 40cm plate with 4 points at coordinates (-0.1,-0.1,0), (0.1,-0.1,0), (0.1,0.1,0), (0.1,0.1,0). Each point is represented by a circle with 2cm radius. 4 points at coordinates (-0.03,-0.03,0), (0.03,-0.03,0), (0.03,0.03,0), (0.03,0.03,0). Each point is represented by a circle with 1cm radius. A 40cm by 40cm plate with 4 points at coordinates (-0.07,-0.05,0), (0.07,0.05,0), (0.07,-0.05,0), (-0.07,-0.05,0). Each point is represented by a circle with 2cm radius. A 40cm by 40cm plate with 4 points at coordinates (-0.05,0.05,0), (0.05,0.05,0), (0.05,-0.05,0), (-0.05,-0.05,0). Each point is represented by a circle with 2cm radius. A 40cm by 40cm plate with 4 points at coordinates (0,-0.1,0), (0.1,0,0), (0,0.1,0), (-0.1,0,0). Each point is represented by a circle with 2cm radius. A 40cm by 40cm plate with 4 points at coordinates (-0.025,-0.05,0), (-0.075,0.05,0), (0.075,0.05,0), (0.025,-0.05,0). Each point is represented by a circle with 2cm radius. Three parallel lines with equation y=-5, y=0, y=5. Three parallel lines representing a road. A tire represented by 2 circles with radius 10cm and 15cm. A pipe represented by a cylinder of 25 cm length and 15cm radius. A cylinder of 80cm length and 10cm radius. A plane represented by a 56cm by 56cm plate with a grid of 49 squares inside. A plate with 8 points at coordinates (0.05,0,0), (0.15,0.05,0), (0.2,0.2,0), (-0.05,0.2,0), (-0.15,-0.1,0), (-0.1,-0.1,0), (-0.05,0.05,0) and (0.5,0,0). ach point is represented by a circle with 2cm radius. Definition at line 161 of file vpWireFrameSimulator.h. Set the path to the scene files (*.bnd and *.sln) used by the simulator. If the path set in vpConfig.h in VISP_SCENES_DIR macro is not valid, the path is set from the VISP_SCENES_DIR environment variable that the user has to set. Definition at line 175 of file vpWireFrameSimulator.cpp. References vpHomogeneousMatrix::buildFrom(), camera, vpIoTools::checkDirectory(), desiredScene, vpIoTools::getenv(), old_iPr, old_iPt, old_iPz, vpMath::rad(), rotz, scene, and vpIoTools::splitChain(). Definition at line 228 of file vpWireFrameSimulator.cpp. References camera, cameraTrajectory, desiredScene, displayCamera, displayDesiredObject, displayObject, fMoList, poseList, scene, and sceneInitialized. Delete the history of the main camera position which are displayed in the external views. Definition at line 294 of file vpWireFrameSimulator.h. Definition at line 78 of file vpWireFrameSimulator.cpp. References vpDisplay::displayLine(), vpImage< Type >::getHeight(), vpImage< Type >::getWidth(), and thickness_. Referenced by vpSimulatorAfma6::getExternalImage(), vpSimulatorViper850::getExternalImage(), getExternalImage(), getInternalImage(), and vpRobotWireFrameSimulator::getInternalView(). Definition at line 122 of file vpWireFrameSimulator.cpp. Display a trajectory thanks to a list of homogeneous matrices which give the position of the camera relative to the object and the position of the object relative to the world reference frame. The trajectory is projected into the view of an external camera whose position is given in parameter. The two lists must have the same size of homogeneous matrices must have the same size. I : The image where the trajectory is displayed. list_cMo : The homogeneous matrices list containing the position of the camera relative to the object. list_fMo : The homogeneous matrices list containing the position of the object relative to the world reference frame. cMf : A homogeneous matrix which gives the position of the external camera (used to project the trajectory) relative to the world reference frame. Definition at line 1269 of file vpWireFrameSimulator.cpp. References camTrajColor, camTrajType, CT_LINE, CT_POINT, vpException::dimensionError, vpDisplay::displayLine(), vpDisplay::displayPoint(), projectCameraTrajectory(), rotz, and thickness_. Definition at line 1315 of file vpWireFrameSimulator.cpp. Get the pose between the object and the camera. The pose between between the object and the camera. Definition at line 405 of file vpWireFrameSimulator.h. Get the homogeneous matrices cMo stored to display the camera trajectory. cMo_history : The list of the homogeneous matrices cMo. Definition at line 413 of file vpWireFrameSimulator.h. Get the pose between the object and the fixed world frame. The pose between the object and the fixed world frame. Definition at line 426 of file vpWireFrameSimulator.h. Get the homogeneous matrices fMo stored to display the camera trajectory. fMo_history : The list of the homogeneous matrices fMo. Definition at line 434 of file vpWireFrameSimulator.h. Get the parameters of the virtual external camera. I : The image used to display the view of the camera. It returns the camera parameters. Definition at line 313 of file vpWireFrameSimulator.h. References vpImage< Type >::getHeight(), vpImage< Type >::getWidth(), vpMath::maximum(), and vpMath::minimum(). Definition at line 332 of file vpWireFrameSimulator.h. Get the main external camera's position relative to the the world reference frame. the main external camera position relative to the the world reference frame. Definition at line 351 of file vpWireFrameSimulator.h. Get the external view. It corresponds to the view of the scene from a reference frame you have to set. I : The image where the external view is displayed. : The objects are displayed thanks to overlays. The image I is not modified. Definition at line 1074 of file vpWireFrameSimulator.cpp. References camColor, camera, cameraTrajectory, camMf, camMf2, camTrajColor, camTrajType, cMo, CT_LINE, CT_POINT, CUBE, curColor, vpImage< Type >::display, vpDisplay::display(), display_scene(), displayCamera, displayCameraTrajectory, displayImageSimulator, vpDisplay::displayLine(), displayObject, vpDisplay::displayPoint(), extCamChanged, f2Mf, fMc, fMo, fMoList, vpImage< Type >::getHeight(), vpImageSimulator::getImage(), getInternalCameraParameters(), vpImage< Type >::getWidth(), vpHomogeneousMatrix::inverse(), vpMath::maximum(), vpMath::minimum(), navigation(), nbrPtLimit, objectImage, poseList, projectCameraTrajectory(), px_ext, py_ext, rotz, scene, vpImageSimulator::setCameraPosition(), SPHERE, and thickness_. Referenced by vpSimulatorAfma6::setPositioningVelocity(), and vpSimulatorViper850::setPositioningVelocity(). Get an external view. The point of view is set thanks to the pose between the camera camMf and the fixed world frame. cam_Mf : The pose between the point of view and the fixed world frame. Definition at line 1203 of file vpWireFrameSimulator.cpp. References camColor, camera, cMo, curColor, vpImage< Type >::display, vpDisplay::display(), display_scene(), displayCamera, displayImageSimulator, displayObject, fMo, vpImage< Type >::getHeight(), vpImageSimulator::getImage(), getInternalCameraParameters(), vpImage< Type >::getWidth(), vpHomogeneousMatrix::inverse(), vpMath::maximum(), vpMath::minimum(), objectImage, px_ext, py_ext, rotz, scene, and vpImageSimulator::setCameraPosition(). Definition at line 811 of file vpWireFrameSimulator.cpp. Definition at line 941 of file vpWireFrameSimulator.cpp. Get the parameters of the virtual internal camera. Definition at line 365 of file vpWireFrameSimulator.h. Referenced by getExternalImage(), and getInternalImage(). Definition at line 384 of file vpWireFrameSimulator.h. Get the internal view ie the view of the camera. I : The image where the internal view is displayed. Definition at line 1000 of file vpWireFrameSimulator.cpp. References camMf, cdMo, cMo, curColor, D_TOOL, desColor, desiredObject, desiredScene, vpImage< Type >::display, vpDisplay::display(), display_scene(), displayDesiredObject, displayImageSimulator, displayObject, fMo, vpImage< Type >::getHeight(), vpImageSimulator::getImage(), getInternalCameraParameters(), vpImage< Type >::getWidth(), vpHomogeneousMatrix::inverse(), vpMath::maximum(), vpMath::minimum(), vpException::notInitialized, objectImage, px_int, py_int, vpColor::red, rotz, scene, sceneInitialized, and vpImageSimulator::setCameraPosition(). Definition at line 737 of file vpWireFrameSimulator.cpp. References cdMo, cMo, curColor, D_TOOL, desColor, desiredObject, desiredScene, vpImage< Type >::display, vpDisplay::display(), display_scene(), displayDesiredObject, displayImageSimulator, displayObject, vpImage< Type >::getHeight(), vpImageSimulator::getImage(), getInternalCameraParameters(), vpImage< Type >::getWidth(), vpHomogeneousMatrix::inverse(), vpMath::maximum(), vpMath::minimum(), vpException::notInitialized, objectImage, px_int, py_int, vpColor::red, rotz, scene, sceneInitialized, and vpImageSimulator::setCameraPosition(). Initialize the simulator. It enables to choose the type of scene which will be used to display the object at the current position and at the desired position. It exists several default scenes you can use. Use the vpSceneObject and the vpSceneDesiredObject attributes to use them in this method. The corresponding files are stored in the "data" folder which is in the ViSP build directory. obj : Type of scene used to display the object at the current position. desired_object : Type of scene used to display the object at the desired pose (in the internal view). Definition at line 261 of file vpWireFrameSimulator.cpp. References camera, cameraFactor, CIRCLE, CUBE, CYLINDER, D_CIRCLE, D_STANDARD, D_TOOL, desiredObject, desiredScene, DIAMOND, displayCamera, displayDesiredObject, displayImageSimulator, displayObject, vpException::memoryAllocationError, PIPE, PLAN, PLATE, POINT_CLOUD, RECTANGLE, ROAD, scene, sceneInitialized, SMALL_PLATE, SPHERE, SQUARE_10CM, THREE_LINES, THREE_PTS, TIRE, and TRAPEZOID. Referenced by vpRobotWireFrameSimulator::get_fMo(), vpRobotWireFrameSimulator::initScene(), and initScene(). Here you can use the scene you want. You have to set the path to a .bnd or a .wrl file which is a 3D model file. obj : Path to the scene file you want to use. desired_object : Path to the scene file you want to use. Definition at line 432 of file vpWireFrameSimulator.cpp. References camera, cameraFactor, D_STANDARD, desiredObject, desiredScene, displayCamera, displayDesiredObject, displayObject, vpException::memoryAllocationError, scene, sceneInitialized, THREE_PTS, and vpERROR_TRACE. Initialize the simulator. It enables to choose the type of object which will be used to display the object at the current position. The object at the desired position is not displayed. It exists several default scenes you can use. Use the vpSceneObject attributes to use them in this method. The corresponding files are stored in the "data" folder which is in the ViSP build directory. Definition at line 526 of file vpWireFrameSimulator.cpp. References camera, cameraFactor, CIRCLE, CUBE, CYLINDER, DIAMOND, displayCamera, displayDesiredObject, displayImageSimulator, displayObject, vpException::memoryAllocationError, PIPE, PLAN, PLATE, POINT_CLOUD, RECTANGLE, ROAD, scene, sceneInitialized, SMALL_PLATE, SPHERE, SQUARE_10CM, THREE_LINES, THREE_PTS, TIRE, and TRAPEZOID. Initialize the simulator. It enables to choose the type of scene which will be used to display the object at the current position. The object at the desired position is not displayed. Definition at line 665 of file vpWireFrameSimulator.cpp. References camera, cameraFactor, displayCamera, displayObject, vpException::memoryAllocationError, scene, sceneInitialized, THREE_PTS, and vpERROR_TRACE. It is also possible to add a list of vpImageSimulator instances. They will be automatically projected into the image. The position of the four corners have to be given in the object frame. imObj : A list of vpImageSimulator instances. Definition at line 413 of file vpWireFrameSimulator.cpp. References displayImageSimulator, initScene(), and objectImage. Definition at line 506 of file vpWireFrameSimulator.cpp. Definition at line 648 of file vpWireFrameSimulator.cpp. Definition at line 722 of file vpWireFrameSimulator.cpp. Enables to change the external camera position. Definition at line 1346 of file vpWireFrameSimulator.cpp. References blocked, blockedr, blockedt, blockedz, vpHomogeneousMatrix::buildFrom(), vpMouseButton::button1, vpMouseButton::button2, vpMouseButton::button3, vpImagePoint::get_i(), vpImagePoint::get_j(), vpDisplay::getClick(), vpDisplay::getClickUp(), vpImage< Type >::getHeight(), vpDisplay::getPointerPosition(), vpImage< Type >::getWidth(), vpMath::minimum(), old_iPr, old_iPt, old_iPz, and vpMath::rad(). Referenced by vpSimulatorAfma6::getExternalImage(), vpSimulatorViper850::getExternalImage(), and getExternalImage(). Definition at line 1435 of file vpWireFrameSimulator.cpp. Project the center of the internal camera into the external camera view. Definition at line 1526 of file vpWireFrameSimulator.cpp. References camMf, vpMeterPixelConversion::convertPoint(), vpPoint::get_x(), vpPoint::get_y(), getExternalCameraParameters(), vpHomogeneousMatrix::inverse(), rotz, vpPoint::setWorldCoordinates(), and vpForwardProjection::track(). Referenced by displayTrajectory(), and getExternalImage(). Definition at line 1544 of file vpWireFrameSimulator.cpp. Definition at line 1563 of file vpWireFrameSimulator.cpp. References vpMeterPixelConversion::convertPoint(), vpPoint::get_x(), vpPoint::get_y(), getExternalCameraParameters(), vpHomogeneousMatrix::inverse(), rotz, vpPoint::setWorldCoordinates(), and vpForwardProjection::track(). Definition at line 1582 of file vpWireFrameSimulator.cpp. Set the pose between the object and the fixed world frame. fMo_ : The pose between the object and the fixed world frame. Definition at line 588 of file vpWireFrameSimulator.h. Set the color used to display the camera in the external view. col : The desired color. Definition at line 452 of file vpWireFrameSimulator.h. Set the position of the camera relative to the object. cMo_ : The pose of the camera. Definition at line 458 of file vpWireFrameSimulator.h. Set the position of the the world reference frame relative to the camera. fMc_ : The pose of the camera. Definition at line 470 of file vpWireFrameSimulator.h. Set the parameter which enables to choose the size of the main camera in the external camera views. By default this parameter is set to 1.
factor : The ration for the camera size. Definition at line 482 of file vpWireFrameSimulator.h. Set the color used to display the camera trajectory in the external view. Definition at line 490 of file vpWireFrameSimulator.h. Set the way to display the history of the main camera trajectory in the main external view. The choice is given between displaying lines and points. camTraj_type : The chosen way to display the camera trajectory. Definition at line 499 of file vpWireFrameSimulator.h. Set the color used to display the object at the current position. Definition at line 509 of file vpWireFrameSimulator.h. Set the desired position of the camera relative to the object. cdMo_ : The desired pose of the camera. Definition at line 515 of file vpWireFrameSimulator.h. Set the color used to display the object at the desired position. Definition at line 521 of file vpWireFrameSimulator.h. Enable or disable the displaying of the camera trajectory in the main external camera view. By default the trajectory is displayed. do_display : Set to true to display the camera trajectory. Definition at line 530 of file vpWireFrameSimulator.h. Set the internal camera parameters. cam : The desired camera parameters. Definition at line 537 of file vpWireFrameSimulator.h. Referenced by vpSimulatorAfma6::initDisplay(), and vpSimulatorViper850::initDisplay(). Set the external camera point of view. cam_Mf : The pose of the external camera relative to the world reference frame. Definition at line 548 of file vpWireFrameSimulator.h. References vpHomogeneousMatrix::buildFrom(), vpHomogeneousMatrix::extract(), and vpHomogeneousMatrix::inverse(). Specify the thickness of the graphics drawings. Definition at line 561 of file vpWireFrameSimulator.h. Definition at line 568 of file vpWireFrameSimulator.h. Set the maximum number of main camera's positions which are stored. Those position can be displayed in the external camera field of view. By default this parameter is set to 1000.
nbPt : The desired number of position which are saved. Definition at line 581 of file vpWireFrameSimulator.h. Definition at line 256 of file vpWireFrameSimulator.h. Definition at line 253 of file vpWireFrameSimulator.h. Definition at line 255 of file vpWireFrameSimulator.h. Definition at line 254 of file vpWireFrameSimulator.h. Definition at line 237 of file vpWireFrameSimulator.h. Definition at line 224 of file vpWireFrameSimulator.h. Referenced by vpSimulatorAfma6::getExternalImage(), vpSimulatorViper850::getExternalImage(), getExternalImage(), vpSimulatorAfma6::initArms(), vpSimulatorViper850::initArms(), vpRobotWireFrameSimulator::initScene(), initScene(), vpWireFrameSimulator(), and ~vpWireFrameSimulator(). Definition at line 271 of file vpWireFrameSimulator.h. Referenced by vpSimulatorAfma6::initArms(), vpSimulatorViper850::initArms(), and initScene(). Definition at line 245 of file vpWireFrameSimulator.h. Referenced by getExternalImage(), and ~vpWireFrameSimulator(). Definition at line 229 of file vpWireFrameSimulator.h. Referenced by vpSimulatorAfma6::getExternalImage(), vpSimulatorViper850::getExternalImage(), getExternalImage(), getInternalImage(), and projectCameraTrajectory(). Definition at line 258 of file vpWireFrameSimulator.h. Definition at line 238 of file vpWireFrameSimulator.h. Definition at line 273 of file vpWireFrameSimulator.h. Definition at line 232 of file vpWireFrameSimulator.h. Referenced by getInternalImage(), and vpRobotWireFrameSimulator::getInternalView(). Definition at line 231 of file vpWireFrameSimulator.h. Referenced by getExternalImage(), getInternalImage(), and vpRobotWireFrameSimulator::getInternalView(). Definition at line 239 of file vpWireFrameSimulator.h. Definition at line 240 of file vpWireFrameSimulator.h. Definition at line 235 of file vpWireFrameSimulator.h. Referenced by getInternalImage(), vpRobotWireFrameSimulator::getInternalView(), and initScene(). Definition at line 223 of file vpWireFrameSimulator.h. Referenced by getInternalImage(), vpRobotWireFrameSimulator::getInternalView(), initScene(), vpWireFrameSimulator(), and ~vpWireFrameSimulator(). Definition at line 268 of file vpWireFrameSimulator.h. Referenced by vpSimulatorAfma6::getExternalImage(), vpSimulatorViper850::getExternalImage(), getExternalImage(), vpSimulatorAfma6::initArms(), vpSimulatorViper850::initArms(), vpRobotWireFrameSimulator::initScene(), initScene(), and ~vpWireFrameSimulator(). Definition at line 244 of file vpWireFrameSimulator.h. Definition at line 267 of file vpWireFrameSimulator.h. Referenced by getInternalImage(), vpRobotWireFrameSimulator::getInternalView(), initScene(), and ~vpWireFrameSimulator(). Definition at line 269 of file vpWireFrameSimulator.h. Referenced by getExternalImage(), getInternalImage(), and initScene(). Definition at line 266 of file vpWireFrameSimulator.h. Referenced by vpSimulatorAfma6::getExternalImage(), vpSimulatorViper850::getExternalImage(), getExternalImage(), getInternalImage(), vpRobotWireFrameSimulator::getInternalView(), initScene(), and ~vpWireFrameSimulator(). Definition at line 275 of file vpWireFrameSimulator.h. Definition at line 259 of file vpWireFrameSimulator.h. Definition at line 228 of file vpWireFrameSimulator.h. Definition at line 227 of file vpWireFrameSimulator.h. Referenced by vpRobotWireFrameSimulator::get_cMo(), vpRobotWireFrameSimulator::get_fMo(), vpSimulatorAfma6::getExternalImage(), vpSimulatorViper850::getExternalImage(), getExternalImage(), getInternalImage(), vpRobotWireFrameSimulator::getInternalView(), vpSimulatorAfma6::initialiseCameraRelativeToObject(), vpSimulatorViper850::initialiseCameraRelativeToObject(), vpSimulatorAfma6::initialiseObjectRelativeToCamera(), and vpSimulatorViper850::initialiseObjectRelativeToCamera(). Definition at line 247 of file vpWireFrameSimulator.h. Definition at line 248 of file vpWireFrameSimulator.h. Definition at line 234 of file vpWireFrameSimulator.h. Definition at line 225 of file vpWireFrameSimulator.h. Definition at line 250 of file vpWireFrameSimulator.h. Referenced by navigation(), and vpWireFrameSimulator(). Definition at line 252 of file vpWireFrameSimulator.h. Definition at line 251 of file vpWireFrameSimulator.h. Definition at line 246 of file vpWireFrameSimulator.h. Definition at line 263 of file vpWireFrameSimulator.h. Definition at line 261 of file vpWireFrameSimulator.h. Referenced by vpSimulatorAfma6::getCameraParameters(), vpSimulatorViper850::getCameraParameters(), getInternalImage(), vpRobotWireFrameSimulator::getInternalView(), vpSimulatorAfma6::initDisplay(), vpSimulatorViper850::initDisplay(), vpSimulatorAfma6::setCameraParameters(), and vpSimulatorViper850::setCameraParameters(). Definition at line 264 of file vpWireFrameSimulator.h. Definition at line 262 of file vpWireFrameSimulator.h. Definition at line 230 of file vpWireFrameSimulator.h. Definition at line 277 of file vpWireFrameSimulator.h. Referenced by displayTrajectory(), getExternalImage(), getInternalImage(), vpRobotWireFrameSimulator::getInternalView(), projectCameraTrajectory(), and vpWireFrameSimulator(). Definition at line 222 of file vpWireFrameSimulator.h. Referenced by vpSimulatorAfma6::getExternalImage(), vpSimulatorViper850::getExternalImage(), getExternalImage(), getInternalImage(), vpRobotWireFrameSimulator::getInternalView(), initScene(), vpWireFrameSimulator(), and ~vpWireFrameSimulator(). Definition at line 242 of file vpWireFrameSimulator.h. Referenced by getInternalImage(), vpRobotWireFrameSimulator::getInternalView(), vpSimulatorAfma6::initDisplay(), vpSimulatorViper850::initDisplay(), initScene(), and ~vpWireFrameSimulator(). Definition at line 279 of file vpWireFrameSimulator.h. Referenced by display_scene(), displayTrajectory(), getExternalImage(), vpSimulatorAfma6::updateArticularPosition(), and vpSimulatorViper850::updateArticularPosition().